Bigelow Aerospace has been working on inflatable habitats for orbit for some years. 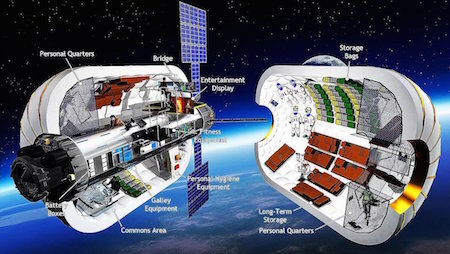 However, they are hoping that their first hotels for lunar orbit will be ready by 2022.
igelow Aerospace, a Las Vegas-based space pod company, wants to send an inflatable space hotel to orbit the moon, with accommodations for astronauts and citizen space travelers alike. The company partnered with NASA in 2016 to attach an inflatable, soft-shell demo pod onto the International Space Station. Now, Bigelow has announced that a bigger inflatable pod, which it's calling the B330 "lunar depot", could be orbiting the moon in five years. That moon station is much more ambitious than Bigelow's ISS add-on. It's designed to stand alone and is about a third of the size of the ISS. The company suggests the pod could hold roughly six people, and is billing it as a hub for "significant lunar business development." SF fans recall the spacious lounge in the orbiting space station in 2001: A Space Odyssey; note the low curving ceiling (this space station was spun on its axis to provide artificial gravity for the guests). Science fiction fans may recall the orbital retirement hotels suggested by Carl Sagan in his 1985 novel Contact. Via A Las Vegas hotel mogul plans to send an inflatable space hotel into orbit around the moon by 2022.